Through its offices located throughout Connecticut, UConn Extension connects the power of UConn research to local issues by creating practical, science-based answers to complex problems. Extension provides scientific knowledge and expertise to the public in areas such as: economic viability, business and industry, community development, agriculture and natural resources. This post, written by Mary Concklin explores how UConn Extension programs impact an agricultural business. Integrated pest management (IPM) takes many forms at Bishop’s Orchards in Guilford. Dr. Jude Boucher, UConn Vegetable Production & IPM extension specialist, has been working with Bishop’s in season long vegetable IPM training aimed at increasing the production of high quality produce while avoiding unnecessary pesticide applications. Boucher has worked with Bishop’s field manager, Michaele Williams, scouting tomatoes on a weekly basis and teaching how to install preventative practices that help lower the incidence of disease and raise the yield and quality of their tomatoes. Preventative practices include plastic and living mulches for weed control, which also serve as a mechanical barrier for spores that might otherwise splash up from the soil. Timely irrigations through trickle lines under the plastic, trellis systems, plant pruning, and proper site selection help keep the plants healthy and growing, lift the plants off the ground, thin the leaf canopy and allow the leaves to dry quicker so that they are less prone to diseases problems. Fungicides can be used only when needed and applied when computer models call for an application or when a disease is actually found during weekly scouting. Insects on tomatoes, Brussel sprouts, onions and other crops are controlled with microbial insecticides that are not toxic to humans and spare natural enemies to help prevent future pest outbreaks. Working with Extension also helps Michaele learn to recognize pests and natural enemies and design management systems on a host of new crops that the farm is now growing, from squash blossoms to beets. Mary Concklin, UConn Fruit Production & IPM extension specialist, works with Bishop’s Orchards with fruit crop IPM. Bishop’s Orchard has been the site of in-field workshops conducted by Concklin for the fruit industry including blueberry pruning and apple tree grafting. Blueberry pruning is important for maintaining plant health, improving berry production, and reducing pest problems, while grafting is an important tool used to top work fruit trees to varieties that are more productive, more marketable or resistant to particular diseases. 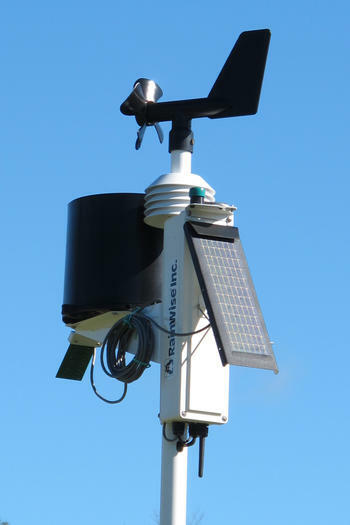 Through a USDA Specialty Crop grant, Concklin installed a solar powered weather station whose data feeds directly into the Network for Environment and Weather Applications (NEWA) at Cornell University. The data, run through pest models and accessible at www.newa.cornell.edu, is used by growers to help with pest management, irrigation and fruit thinning decisions. Concklin, in cooperation with Bishop’s Orchards and the USDA, has also been using pheromone traps to monitor for the presence of the new invasive insect pest, the Brown Marmorated Stink Bug. In addition she has monitored the bramble crops for the presence of the Spotted Wing Drosophila, another new invasive insect pest. Information garnered from these activities has been useful to the Bishop’s in determining management strategies. This entry was posted in Agriculture, Environment, Food, Food Safety and tagged economic viability, fruit production, integrated pest management, IPM, NEWA weather stations, research, UConn Extension, vegetable production.